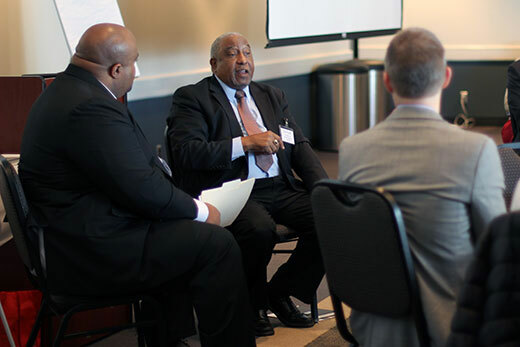 Civil rights veteran Bernard Lafayette (center) speaks at Emory's first higher education Summit on Race, held in February. Faculty and staff campus leaders from around the country will convene here Nov. 11 for the next Summit on Race. When: Friday, Nov. 11, 8 a.m. to 5 p.m.
About: An interactive, daylong workshop intended to equip university faculty and staff in developing responses to hostility and injustice with strategic best practices that build community. This marks the second time this year that Campus Life’s Emory Higher Education Institute has hosted a higher education summit on race to discuss critical issues, offer professional development opportunities, and provide a forum for dialogue and community-building. An inaugural event in February drew 50 participants from more than a dozen colleges and universities from the Southeast and as far away as California. At the Nov. 11 summit, participants will consider how campus leaders can best respond to political divides within a national climate of social and political turmoil and how to assist students in a new era of American racial politics. The daylong, interactive workshop will be held in the Winship Ballroom at the Dobbs University Center. Tickets are $100, which includes a continental breakfast and lunch; a group discount is available. Registration ends Monday, Nov. 7. Heightened rhetoric around race and ethnicity during this election year and the national emergence of the Black Lives Matter movement have contributed to the need for faculty, staff and administrators to get together to discuss the current racial climate on campuses, says Dona Yarbrough, senior associate dean in Emory’s Division of Campus Life and special assistant to the provost. With a deep pool of faculty and staff experts in the fields of racial and social justice, “we knew Emory would be a great place to have that conversation,” adds Yarbrough, noting that the summit is drawing participants from around the U.S. The daylong workshop will draw upon the experiences of participants and utilize full-sensory training modules developed by two grassroots organizations — Contested Conversations and Fearless Dialogues — that specialize in creating spaces to discuss difficult issues. “The seminar is an opportunity for people to learn and practice skills they’ll need to engage in similar dialogues on their own campuses,” Yarbrough says. Co-facilitators will be Ed Lee, executive director of the Center for the Advancement of Student Advocacy and Agency, and the Rev. Gregory Ellison, associate professor of pastoral care and counseling in Emory’s Candler School of Theology. An award-winning debate coach, Lee leads Emory’s nationally acclaimed intercollegiate debate team The Barkley Forum, its civic and community service programs, and Emory’s programs focused on student belonging. He is a frequent national media commentator for U.S. presidential debates and often appears on CNN to discuss presidential debate strategies and their impact on national politics. Ellison’s teaching draws from his work with the organization Fearless Dialogues, a non-profit initiative he founded that creates unique spaces for unlikely partners to have hard, heartfelt conversations on taboo subjects like racism, classism and community violence. Open to higher education faculty, staff and administrators, the workshop should be of interest to campus leaders seeking to affect positive change, says Lee. “Race continues to be one of those vexing issues we wrestle with on not only our campuses, but also a lot of campuses across the United States as we continue to evolve into a pluralist nation that is forced to find ways to creatively resolve our conflicting norms, values and perspectives,” he says. Lee and Ellison plan to facilitate an interactive workshop that is both communal and collaborative. “Based upon what I have seen in communities both on and off campus, there is definitely a relentless yearning for a space for this conversation,” says Lee.